Plankton found on the surface of the International Space Station (ISS) in August was not the first discovery of its kind made by astronauts. In 2013, Russian scientists found other cryptic organisms. If bacteria can survive and reproduce in space, as NASA suspects, it may pose a danger to the health of astronauts and jeopardize future missions to Mars. However, Russian biologists believe that the concern is unfounded. In late August, Russian astronauts reported a surprising discovery: they found traces of sea plankton on the surface of the ISS, practically in open space. Even before this recent discovery, Russian scientists had found mysterious microorganisms on the outside surface of spacecraft. It appears that microorganisms can live on and even multiply for several decades despite harsh space conditions such as radiation, temperature and vacuum. Where did the plankton come from? The discovery was made by astronauts Oleg Artemyev and Alexander Skvortsov during an experiment called "Test." Oleg posted the process of collecting samples for research on his personal website. Among other things "Test" was intended to assess conditions for the life of microflora, including destructive microorganisms. The most fascinating aspect of this story is not even the plankton that somehow made its way into outer space. Strange is how it appeared on the surface of the space station, which is located 420 kilometers away from Earth. Scientists have always thought that microorganisms attach themselves to equipment on Earth before they are launched into space. The problem is that ISS spaceships are launched from Baikonur Cosmodrome, which is located in a desert. Surely, sea plankton could not have attached itself to the surface of a space ship in such an environment. Vladimir Solovyev, Chief of the Russian mission of the ISS claims that the plankton could have attached itself to the object through rising air currents, which settle on the surface of the space station. What should mankind be prepared for? Because of Artemyev’s discovery, scientists are now faced with the question of safety when it comes to microorganisms and bacterial survival. The concerns are primarily relevant to future flights to Mars, which the United States and Russia have been actively preparing for. 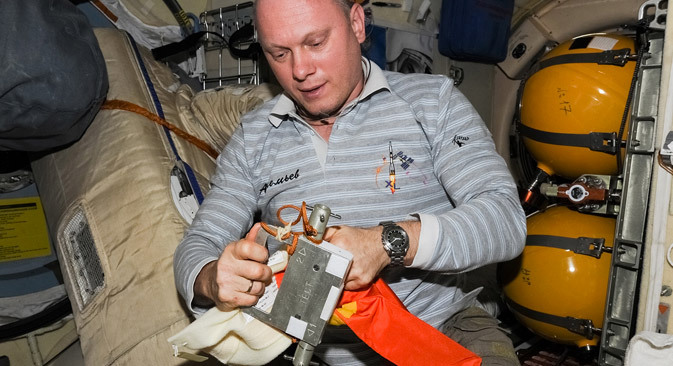 According to the hypothesis of NASA scientists, if these bacteria can both survive and mutate in open space, the weakened immune system of astronauts might not be able to cope with infections. However, Russian biologists believe that these viruses cannot be destructive or passed on to the planet’s inhabitants after the astronauts return from space. In other words, humans are not in any immediate danger of having to live through a horror movie scenario. Ivan Marin, Ph.D., a researcher at the A.N. Severtsov Institute of Ecology and Evolution, told RBTH that no cases of dangerous mutations of viruses in space have been documented. "It is unlikely that such mutations will take place,” Marin says. “The virus has a greater chance of becoming more dangerous when forced to adapt to the effects of drugs. And this is a normal evolutionary process. But purely external conditions won’t turn the virus into a monster”. Despite the fact that information regarding the plankton study has yet to be confirmed, this finding has well founded scientific explanations. Scientists have made similar discoveries in the past. Slobodkin says that the equipment used on the moon was also examined and an interesting discovery was made. The astronauts retrieved a camera that had been on the moon for 2.5 years. On its surface, microbiologists found the perfectly ordinary terrestrial bacteria Streptococcus mitis. By no means protected from the harmful effects of open space, it somehow managed to survive on the moon this whole time. “This discovery speaks to the fact that the bacteria had not undergone any extreme changes while in space,” Slobodkin says. In May 2005, scientists conducted experiments on lichen. The organism survived the first two weeks in outer space with no complications. It retained the ability to photosynthesize and was by all accounts unchanged. Last summer, the results of several scientific experiments proved that some microorganisms can survive in open space under the influence of zero-gravity fields, vacuum, low temperatures, and radiation. The microorganisms used in the experiment were tardigrades, microscopic invertebrates. However, they were able to survive in space for a maximum of 10 days. Some space microorganisms of unknown origin are remarkable for their ability to survive in any conditions. One such microorganism was discovered after the collapse of the space shuttle Columbia, which exploded 61 kilometers above the earth in 2003. Many experiments with bacteria were on board and none of them survived. But scientists did discover an alien microorganism, which was a natural impurity onboard the space shuttle. It survived the passage through the upper atmosphere, the explosion, and the fall from a height of 61 kilometers.